The Therasia Resort Sea & Spa is located in the Aeolian Islands, a UNESCO heritage site and a prime destination for an unforgettable holiday in Sicily. It is set on the island of Vulcano, 800 metres from the sea and the beach of Sabbie Nere, one km from the centre of the island and just 5 minutes by hydrofoil from the more touristy Lipari. 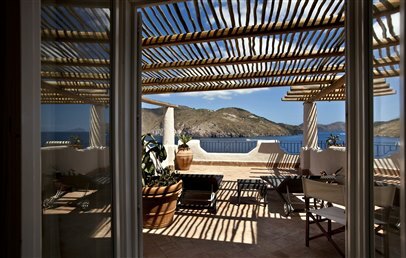 Therasia Resort Sea & Spa offers stunning views of the sea and the other Aeolian islands. 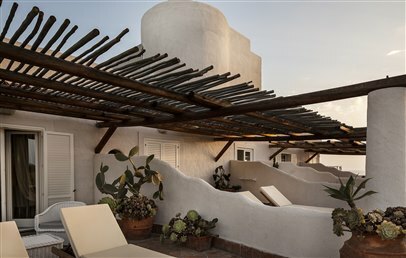 With its intimate and refined charming atmosphere, Therasia Resort welcomes you with its typical white-washed walls and local building materials (volcanic rock from Mount Etna, Sicilian terracotta, cedar wood). It has 97 rooms, each exquisitely designed and furnished, an exclusive Spa and a Beauty Centre, three restaurants, two bars and many welcoming common areas. The garden surrounding the Therasia Resort is planted with cacti, succulents and other typical plants. Here, surrounded by greenery and with view over the sea, are large terraces and two infinity pools with their respective sunbathing areas. 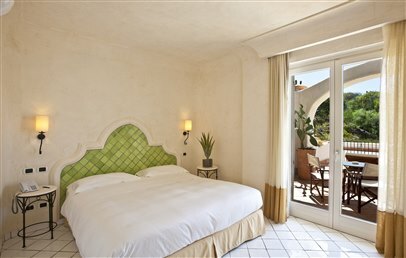 With double bed or twin beds, the rooms at Theresia Resort Sea & Spa stylishly furnished in Mediterranean style with care shown in every detail, such as the bedsteads in wrought iron or with colourful majolica decorations. They are equipped with satellite TV, individually controlled air conditioning, minibar (with complimentary soft drinks), safe, free Wi-Fi connection and en-suite bathroom in black volcanic stone and glazed coloured Sicilian terracotta tiles. Classic (20 sqm) – balcony with garden view, en-suite with bathtub or shower. Comfort (22 sqm) – balcony with direct sea view. 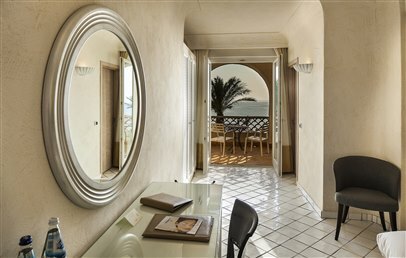 De Luxe (26 sqm) – furnished terrace with direct sea view, en-suite with bathtub and/or shower. 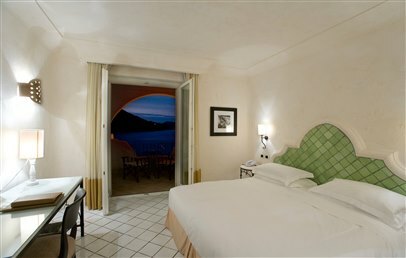 Junior Suite (31 sqm) – double room and lounge area with sofa bed, bathtub and/or shower, balcony with sea view. Master (24 sqm) – double room, large terrace with Jacuzzi tub. Suite – canopy bed, lounge area and terrace with sea view. 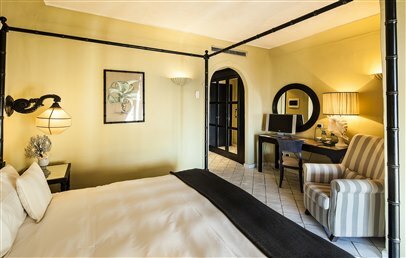 Suite Piscina – double room and lounge area with two sofa beds facing each other and two bathrooms. Terrace with sea view and Jacuzzi bathtub. A comfortable stepped pathway takes Therasia's guests down to the sea and an area equipped with beach umbrellas and sun loungers. Close to the Resort and all around the island there are many beatiful beaches not to be missed, such as Acque Calde, Gelso and Asino. At the hotel, two elegant infinity swimming pools with hydromassage, flanked by stylish comfortable sun loungers. Therasia Resort's Spa centre includes an indoor pool and hydromassage, sauna, Turkish bath and emotional shower. Guests can choose from a broad range of face and body treatments, massages, hydrotherapy and relaxing baths. With three restaurants and two bars, Therasia boasts a variety of dishes and dining settings. The buffet breakfast is served at the Arcipelago restaurant, which is open in the evening as well for a typical Sicilian dinner. Lunch can be enjoyed at the grill and pizza restaurant "I Grusoni" or at the pool bar "La Pomice". The restaurant "Il Cappero" is a gourmet restaurant with 1 star Michelin offering a very good alternative for a delicious dinner. Aperitifs, cocktails and live music at Lounge Bar Il Faraglione. Wi-Fi internet access in the common areas, shuttle bus to the village centre and port, scooter rental, diving and windsurfing nearby. 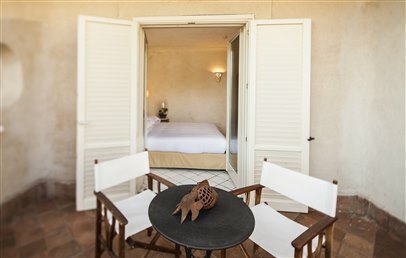 Welcoming, charming double or twin rooms in the delightful Mediterranean style with headboards in colourful Sicilian majolicas or in wrought iron. They are equipped with satellite TV, individually controlled air conditioning, minibar (with complimentary soft drinks), safe box, free Wi-Fi. 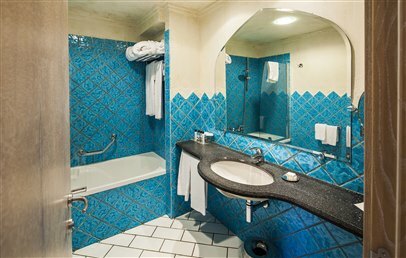 The bathroom, in black volcanic stone and glazed Sicilian terracotta tiles has a bathtub and/or shower, bathrobes, slippers, hair-dryer and complimentary toiletries. They have a balcony with garden view. Charming double or twin rooms in the delightful Mediterranean style with headboards in colourful Sicilian majolicas or in wrought iron. They are equipped with satellite TV, individually controlled air conditioning, minibar (with complimentary soft drinks), safe box, free Wi-Fi. The bathroom, in black volcanic stone and glazed Sicilian terracotta tiles has a bathtub and/or shower, bathrobes, slippers, hair-dryer and complimentary toiletries. They have a balcony with direct sea view. 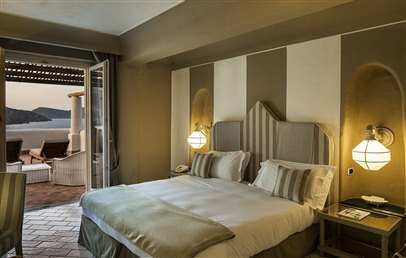 Spacious and welcoming double or twin rooms in the delightful Mediterranean style with headboards in colourful Sicilian majolica tiles or in wrought iron. They are equipped with satellite TV, individually controlled air conditioning, minibar (with complimentary soft drinks), safe box, free Wi-Fi. 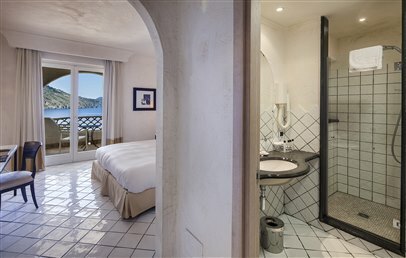 The bathroom, in black volcanic stone and glazed Sicilian terracotta tiles has a bathtub and/or shower, bathrobes, slippers, hair-dryer and complimentary toiletries. They have a terrace with direct sea view, equipped with sun loungers.